Have you been overtaken by off road culture? There’s a wide world to explore, but to do it you are going to have to ensure that your vehicle stays in good condition. Many of the stresses of off road driving require a bit more care than those of dry pavement only vehicles. To stay out on the trails, it’s imperative that you keep on top of your Truck/SUV maintenance. To that end, we have listed some 4×4 maintenance tips to give you an idea of what that entails. Many of these tips apply to car maintenance in general, but become even more important in regard to 4×4 vehicles. While a staple part of any type of car ownership, getting your oil changed regularly is extremely important for 4×4 vehicles. Many off road applications put a lot of stress on your engine, especially when you’re in 4×4 low, which uses a lower gear to increase torque. Check your owner’s manual for the proper oil change intervals for your vehicle, and stick to them. This is another staple of car ownership that only increases in importance with 4×4 vehicles. First, for many 4×4 transfer cases, tire size has to be equal in order to shift. Excessive wear and tear on your treads can actually damage your transfer case for this reason. On top of this expensive possibility, front and rear tires wear at a vastly different pace in 4×4 vehicles, so regular tire rotations are necessary for tire life and safety as well. Your tires need to be balanced as well as rotated, as this keeps the weight distribution equal around the axle. Each bump in the road and rock on the trail knocks your balance off by just a little bit. Getting your tires balanced at regular intervals prevents uneven wear on your tires and suspension. You may start to notice a theme in 4×4 maintenance, and that is avoiding excessive tire wear. Another common cause of tire wear is misalignment. Not only can misalignment cause tire wear, but it decreases handling and gas mileage as well. If you feel your steering wheel pulling to one direction, take it to the shop. Best case, your tires are just unevenly inflated. Even if your tires do need to be aligned, the service pays off in the long run. Before any big off road adventure, it’s important to check all of your vehicle’s fluid levels. Making it a prerequisite before you leave can save you a lot of hassle, and possibly a long hike and call to AAA, if you end up catching the problem before you’re on the trail. Start by checking your engine oil, as it is the most important. Even if you get your regular oil changes, check the oil level as well, looking out for contamination. Next on the list is engine coolant, which is extremely important in keeping your engine from overheating. Finally, make sure you have windshield washer fluid. It’s also a good idea to keep a jug handy in your vehicle on long trips. Trails are full of dirt and grime, that’s part of why we love them! However, over time, those contaminants begin to block your air filter, which can compromise engine function. In general, it is recommended to have your air filter changed every 15,000 to 30,000 miles. However, if you constantly frequent trails and dirt roads, it is advised to up the intervals of your air filter changes. 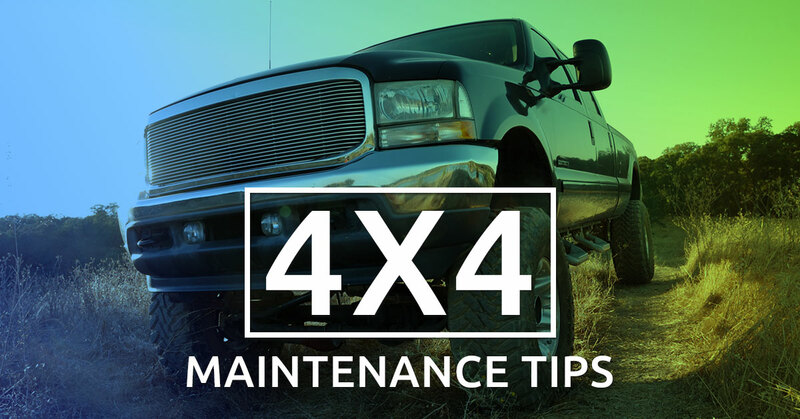 The maintenance aspect is only half the battle; if you want to ensure your 4×4 truck or SUV lasts as long as possible, it is important to know its limits. Different driving applications put different kinds of stress on your vehicle. Daily commutes, towing, off roading, all take a toll on your vehicle. When off roading, the environment you’re tackling comes into play. Make sure to scout any sharp hills before climbing, and always check depth before crossing any water. One great way to get a feel for the limits of your vehicle is to have regular discussions with your mechanic. Let them know what your truck or SUV goes up against, and they can advise you on the best maintenance schedule. One of the most useful, and often overlooked, pieces of truck maintenance is just knowing when to bring in a professional. The best way to know this is through regular vehicle inspections. While it does require a mechanic you can trust, catching problems before they arise is the most cost efficient way of keeping your vehicle in good condition. Hopefully you found these tips useful. Here at Fort Collins Foreign Car Service, we offer 4×4 repairs and maintenance services. If you have any questions about your car or truck, or about our repair services, don’t hesitate to give one of our trusted mechanics a call or drop by the shop today.